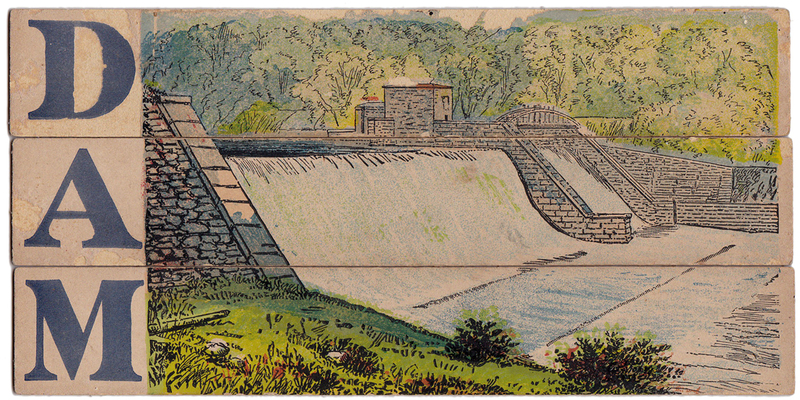 These two nineteenth century puzzles, showing the Old Croton Dam and High Bridge, were part of a set called Sliced Objects, published by E. G. Selchow & Co., circa 1867 to 1880. 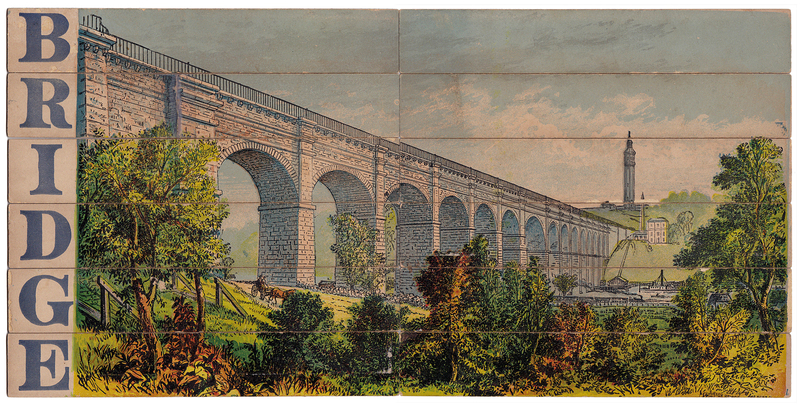 The puzzles came in a box (shown below) along with puzzles of other New York landmarks—the Bethesda Fountain, St. Paul’s Church, the statue of Washington in Union Square—and puzzles for coach, yacht, engine and other words. 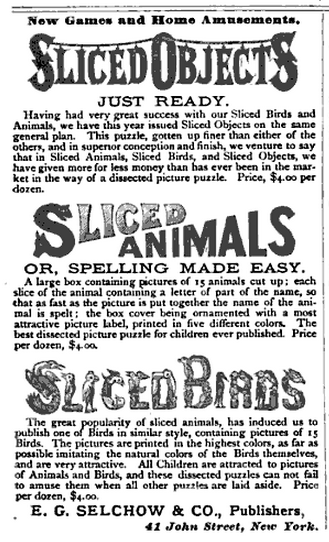 Selchow was one of the major game and puzzle companies of the Victorian era and sold several “sliced” puzzle sets, including Sliced Animals and Sliced Birds. The series was popular enough that it was copied by another company, resulting in an 1883 trademark infringement lawsuit (Selchow v. Baker), which Selchow won. 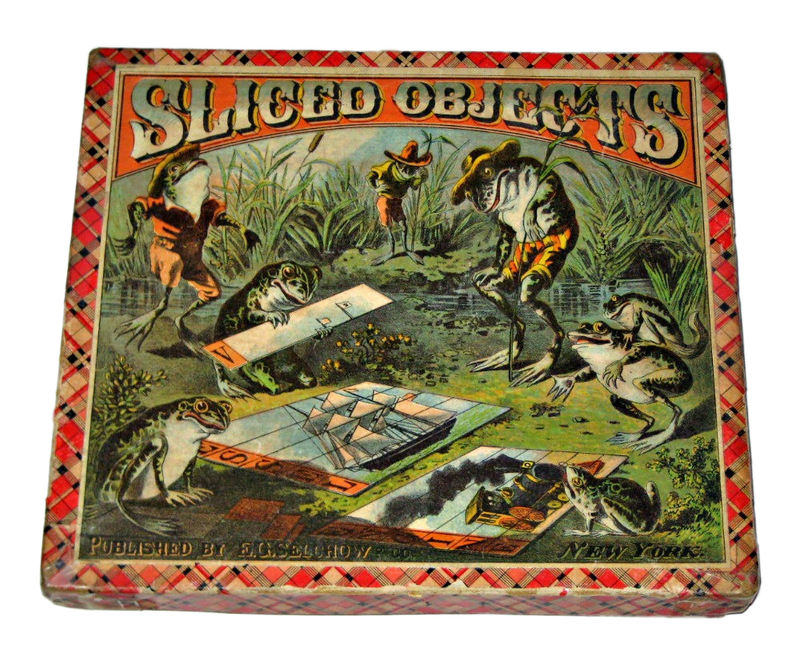 In 1880 John Righter became a partner and the company name was changed to Selchow & Righter. The firm remained a top game and puzzle company into the twentieth century, remembered by aficionados for Parcheesi, Scrabble and Trivial Pursuit. Many thanks to Etsy seller paintedpony99 for permission to use the box image.